When Maxence and I were in San Francisco late last summer, we had bagels for breakfast every single day. There were a couple of bagel shops not far from where we were staying, so we alternated between the two, and on those mornings that we went for a run through the Golden Gate Park, bagels awaited at a busy coffee shop by the ocean. On our last day, sad that our vacation was coming to an end and sad to be leaving the city, I saw this one way of making myself feel better: I promised myself I’d bake bagels for us back in Paris. It would at least alleviate the withdrawal symptoms on that particular front. If you’re unfamiliar with the way bagels are made, the most characteristic thing you should know is that they are cooked in two steps: first you poach them in a pot of water, then you bake them in the oven. Oh, sure, I’ve found bagels in Paris in the past, and you can even buy them from the ubiquitous chain of frozen foods stores (they come with a bunch of emulsifiers and preservatives, if you’re into that sort of thing), but it’s never been quite the same. If you’re unfamiliar with the way bagels are made, the most characteristic thing you should know is that they are cooked in two steps: first you poach them in a pot of water, then you bake them in the oven. And for some reason, the poaching step had always seemed daunting to me: what if I dropped them in and they fell apart, or dissolved, or sank to the bottom of the pot and never floated back up? Would I have to hire divers and send them on a recovery mission to salvage the sunken bagels? Reinhart didn’t seem to suggest that this might happen, so I forged ahead. Before I got to that point, though, I’d had to overcome two procurement hurdles. 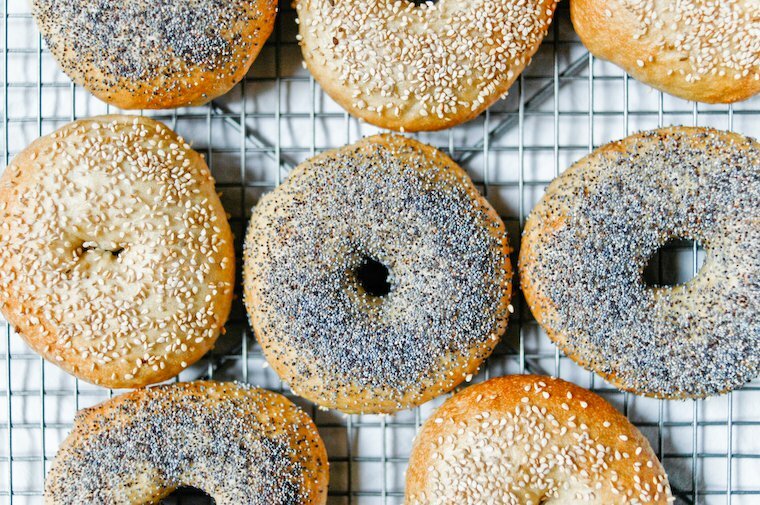 First, bagels must be made with flour that has a high rate of gluten: in the US, you would make them with high-gluten flour or bread flour. 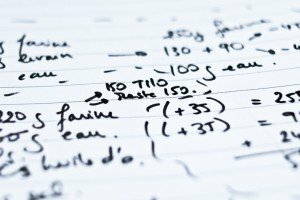 Unfortunately, French flour is significantly lower in gluten than American flours — it has to do with the different types of wheat that we grow and mill — and as Jane had warned me from her past experience, it would not work. So, my mission was to find powdered wheat gluten that I could add to my flour to boost its gluten content. The bagels were fantastic, and just what I was hoping for: great flavor and just the right density and chewiness, the perfect carriers for the all-natural, chunky peanut butter I brought back from California. 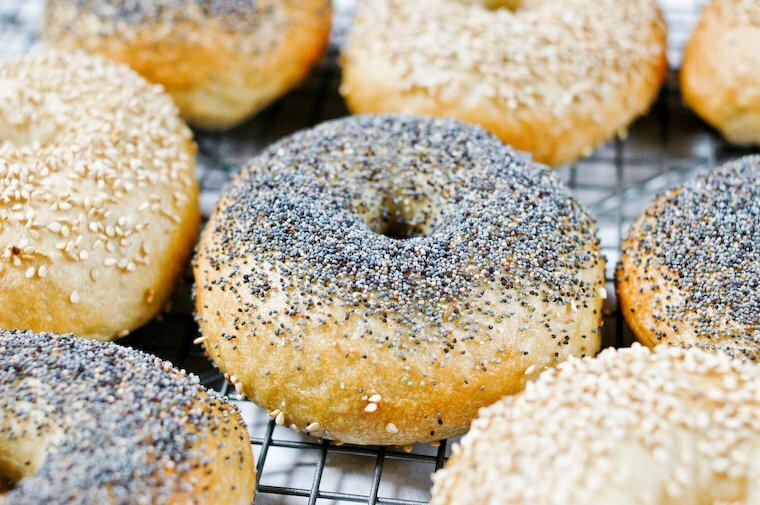 Second, part of what gives bagels their distinctive flavor is that the dough is lightly sweetened with barley malt, in powder or syrup form. In France, this goes by the names of sirop d’orge, malt d’orge or sirop d’orge malté. I had to try a few organic food stores, but I ended up finding both of these ingredients at the same one**; I almost hugged the cashier. 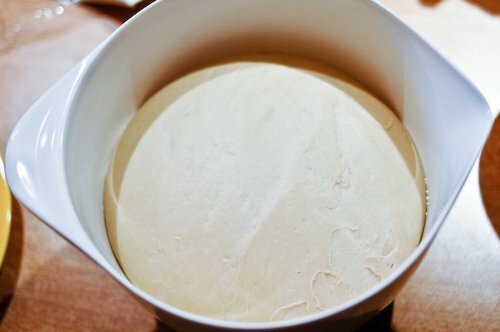 I mostly stuck to Peter Reinhart’s method, except for a few things: I modified the recipe to use some of my sourdough starter in the sponge (enough to produce a final 1-to-3 ratio between starter and flour) and reduced the amount of commercial yeast. I also halved the recipe (his produces 12 large bagels; I made 8 medium). 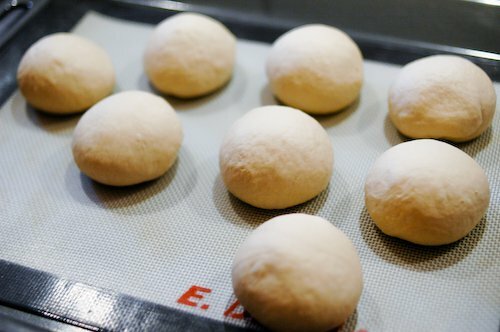 I took some liberty with the order of the steps, too: Peter Reinhart’s recipe has you make the dough, shape the bagels, lay them out on baking sheets, and then leave them overnight in the refrigerator (a step called retarding), before you poach and bake them the next day. The thing is, I have a Paris-sized fridge that is stuffed to the gills with, well, food, and the notion that I should just free up two (of the four) shelves to place baking sheets for the night is heroic fantasy. So, instead of shaping the bagels pre-retarding, I simply placed the ball of dough in the fridge (it was a challenge just to make room for the bowl) and shaped it the next day. I was not struck by the wrath of the bagel gods during the night, so I assume it wasn’t too big of a commandment to break. The whole process was a lot of fun, and much less involved than I thought: the dough is rather stiff, which makes it easy to handle once kneaded (though I hear it’s quite a workout to knead it by hand), and the poaching step went surprisingly smoothly. As for the bagels themselves, they were fantastic, and just what I was hoping for: great flavor and just the right density and chewiness, the perfect carriers for the all-natural, chunky peanut butter I brought back from California. Now, if only I could persuade my neighborhood grocery store to carry cream cheese, I’d be all set. 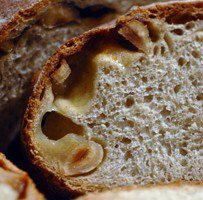 * I just stumbled upon this video of a talk Peter Reinhart gave on bread, via Nicole’s blog. I can’t imagine anyone watching it and not wanting to bake bread right this minute. ** I found malt syrup and wheat gluten at the Biocoop store at 73 rue du Faubourg Poissonnière in the 9th (map it! ), 01 44 79 06 44, open Mon-Sat 9:30am-8pm. 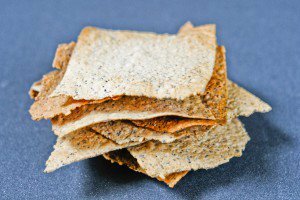 an assortment of seeds: sesame seeds, poppy seeds, etc. On the first day, prepare the sponge: combine all the ingredients for the sponge in a large bowl or in the bowl of your stand mixer. 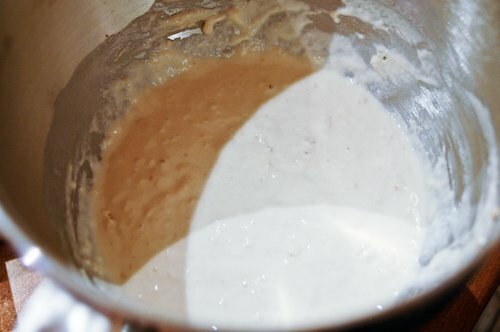 Stir until you get a batter-like consistency, cover, and let rest for 2 hours, until bubbly. 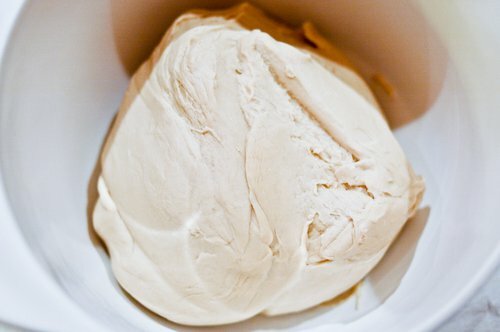 Make the dough: add the dough ingredients, from yeast to malt syrup, to the sponge, stir to combine, then knead by hand for 10 minutes (others have reported it took longer than that) or in a stand mixer fitted with the dough hook for 8 minutes. 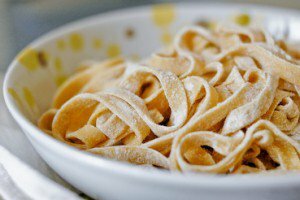 All of the flour should be incorporated within the first 2 minutes or so: if the dough is too dry to incorporate all the flour, add a few drops of water. 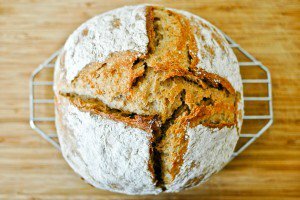 Knead until the dough becomes smooth and pliable; it will be fairly stiff, but it should feel pleasant to the touch, not dry. Cover the bowl with a kitchen towel and let stand at room temperature for 1 hour, then cover with plastic wrap and place in the fridge until the next day (the dough can stay in the fridge for up to 2 days). 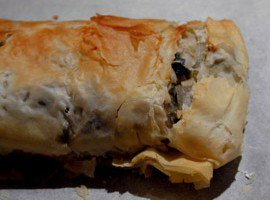 The next day, remove the dough from the fridge and let it come back to room temperature for 1 hour. Have ready 2 baking sheets lined with parchment paper, lightly misted with oil, or a silicon baking mat. 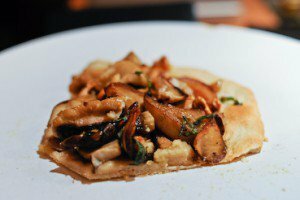 Turn the dough out onto your work surface and divide it into 8 equal pieces, each of them weighing about 100 grams (3 1/2 ounces). Shape each piece into a roll as demonstrated in this video. Pierce each roll in the middle with your thumb, then use the fingers of both hands to stretch out the hole you've just created, and form the typical bagel shape. At this point, the hole needs to be somewhat wider than you think it should be, because the dough will spring back as it rests. 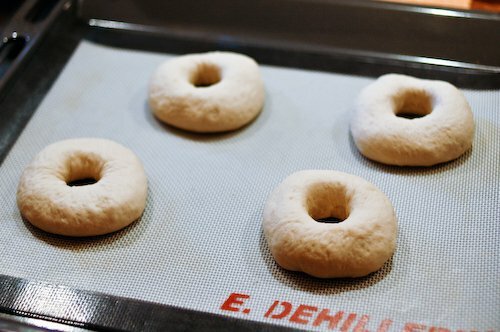 As you shape the bagels, arrange them on the prepared baking sheet. Cover loosely with kitchen towels and let rest for 15 minutes. Preheat the oven to 260°C (500°F) with two racks close to the center of the oven, and bring a wide pot of water (about 15 cm or 6 inches deep) to the boil. Have ready one or several wide, shallow bowls (or soup plates) holding the seeds you want to coat the bagels with. Check whether the dough is ready to be poached using the float test: drop one of the bagels in a bowl of room temperature water; it should float within 10 seconds (mine did a lot faster than that). 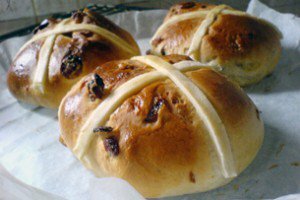 If it doesn't, return to the baking sheet, and wait for 5 to 10 minutes before testing again. 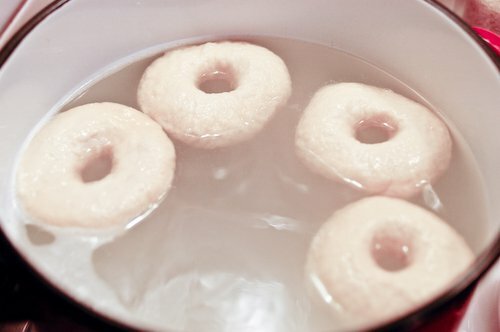 When the dough is ready, add the baking soda to the pot of boiling water and drop in as many bagels as will comfortably fit; my pot could accommodate 4 bagels. Cook for 1 minute, flip using a skimmer or slotted spoon, and cook for 1 more minute on the other side (extend to 2 minutes if you like them chewier). 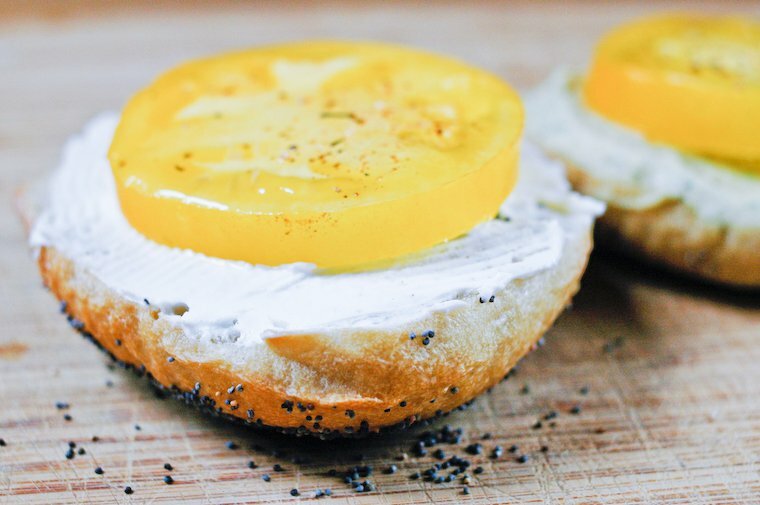 Notice that the bagels have a prettier, rounded side; try to keep track of which one it is. 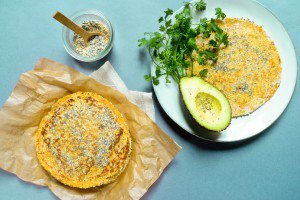 Fish out the bagels with the slotted spoon one by one, dip them on both sides in the prepared seed bowls, then place them, pretty side up, on the baking sheet. Repeat the poaching process with the remaining bagels. 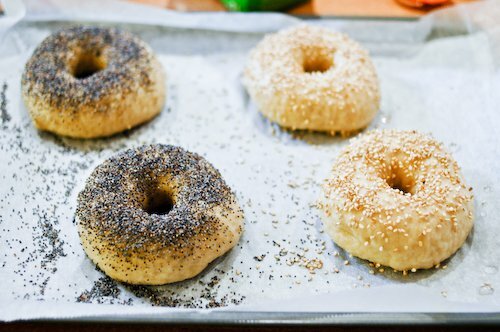 Once all the bagels are poached and coated with seeds, insert the baking sheets in the oven and bake for 5 minutes. Switch the baking sheets (so the bottom sheet is at the top and the top sheet is at the bottom) and rotate them front to back as well. Lower the heat to 230°C (450°F) and bake for another 5 minutes, a few minutes more if you like them a bit darker. This recipe is a two-day process.